Nicole & Josh are so in love! I met Nicole and Josh at a Chicago coffee shop earlier this year. I knew that I'd have fun working with them when Nicole came with wet hair after her hair appointment gone long. :) Anyone that knows me knows that this is my type of girl! I was thrilled when they sent me the email saying they too wanted me to be their wedding photographer. Nicole & Josh have been in the making for years. 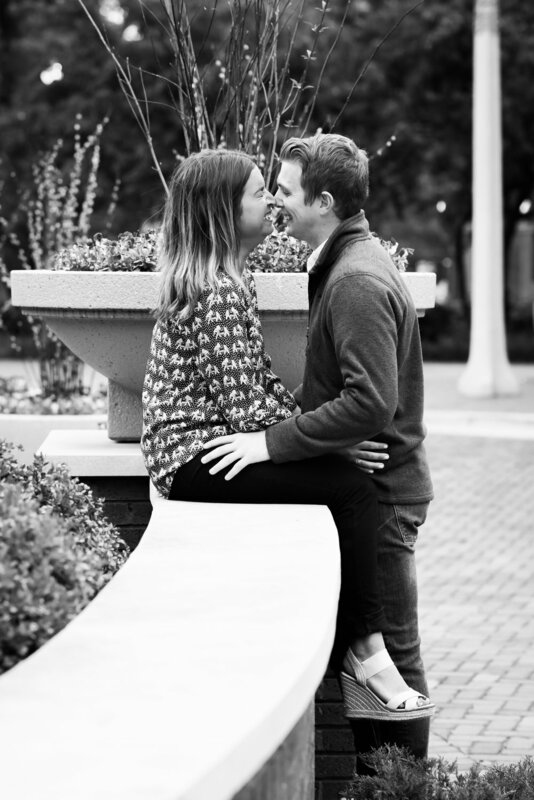 Josh proposed to Nicole in one of her favorite Chicago spots - the Lincoln Park Zoo. So, naturally, we set up the engagement photos to capture this special place. On the bench in the Lincoln Park Zoo where Josh proposed to Nicole. These two were so fun to photograph. They were so relaxed - which is a HUGE key to getting photos that look like you. The iconic bridge over South Pond is one of my favorite spots to take photos! Nicole & Josh were up for anything - including dancing in the park. :) So romantic! I had to remind myself that I should be taking pictures instead of just watching their happiness. 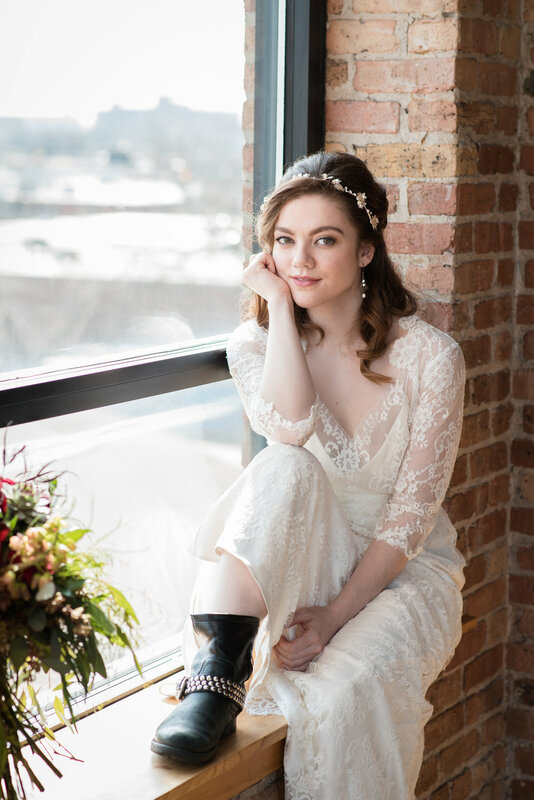 Let me introduce you to Bella Wholey - stunning actor / model in the Chicago area. 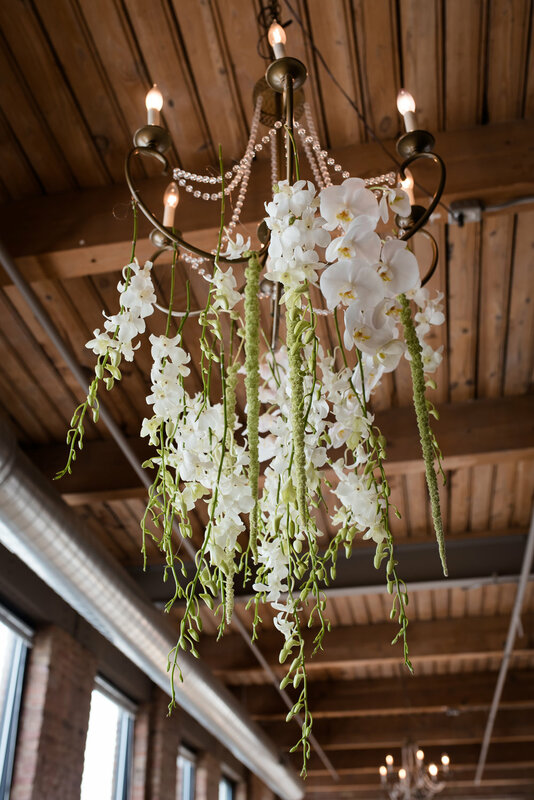 City View Loft in Chicago is the perfect event space with lots of great windows and a view of the city. Plus, it is a great size with tons of flexibility. 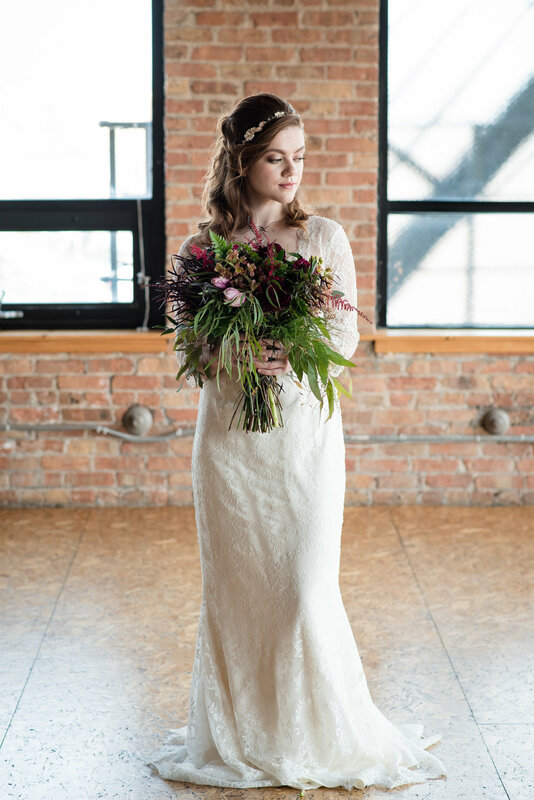 Mignonette Bridal supplied the dresses. This was was so cool - it has a satin finish (you'll see later) and also a lace sheath to wear over the top. Dirty Boots Flowers provided the stunning floral arrangements. One of my favorites from the day! Bella is gorgeous. 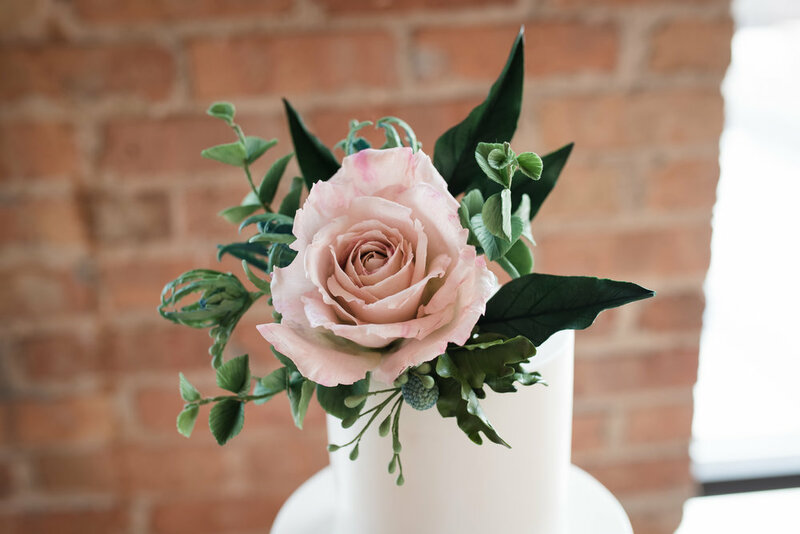 Elysia Root Cakes creates gorgeous gourmet desserts. This flower is made out of SUGAR! Also, the invitations were designed by Pulp & Ink. 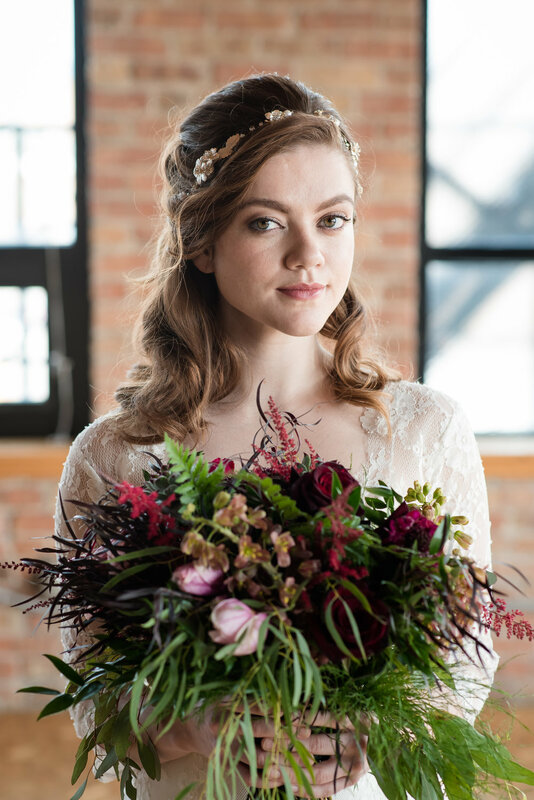 I am already dreaming about my next styled shoot! Recently I had the pleasure of watching two of my friends get married in New York. :) Here is the VERY happy couple the day after the wedding. While I attended as a guest (and had a killer time! ), I was able to take their engagement photos when they visited last fall. Yes, they are wearing matching t-shirts. :) Love it! I do enjoy being a wedding photographer, but I LOVE attending as a guest! Jordan & Brad's wedding was so gorgeous and a ton of fun. To Jordan & Brad, I wish the most happiness life and marriage can bring. You deserve nothing less! I met Nina while working at Kinmont - a former (delicious!) seafood restaurant in River North. We hit it off and when Greg proposed she asked me to photograph her wedding! A few weeks ago we met up in downtown Chicago and took their engagement photos. It was one of those days on Navy Pier where it was so windy the water was being carried from one side of the pier all the way to the other. Lucky, Nina has gorgeous, silky hair that wasn't phased by the extreme wind. Nina and Greg, I cannot wait to photograph your wedding this fall. I know there will be tons of laughter, partying and love all around. Thank you for picking me to be your photographer!